Of all the adult only hotels in Aruba, the recently built Ocean Z is the only hotel with a rating of five stars. The Ocean Z was opened for business in July 2016. The small luxury hotel boasts ultimate privacy for couples and features a clean and minimalist design. A famous Venezuelan architect designed the iconic hotel; his works include the church of Santa Rosa de Lima and the Concert Hall in Caracas, the capital of Venezuela. The Ocean Z offers just 13 rooms, spread across two adjacent buildings. The hotel’s luxury suites feature spectacular ocean views and an infinity pool. Double rooms are elegantly furnished and have a size of over 400 square feet. A private outdoor shower with deck will keep you cool. The hotel is located right on Aruba’s renowned Ocean Drive, just steps away from Boca Catalina, Malmok Beach and Arashi Beach, some of the best beaches of the island. Top facilities include a gourmet restaurant and a convenience store. Upon arrival, the hotel’s multilingual staff will take care of your transfer, arrange your car rental and welcome you with a glass of champagne. Highly Recommended! Through the years, the Bucuti & Tara Beach Resort has established itself as one of the best resorts in Aruba for couples. 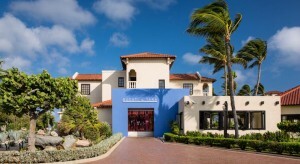 It is the only adult only hotel in Aruba that offers a four-star experience. Bucuti is located right at the widest and most secluded part of the renowned Eagle Beach, one of the best beaches of Aruba and arguably one of the best in the Caribbean. The award-winning and eco-friendly beach resort is an intimate getaway for couples in search of relaxation and romance, away from the busier high-rise hotels. All 104 rooms at Bucuti are non-smoking and have air purifiers. They range from Standard and Superior Rooms with a garden view to the romantic oceanfront Tara Suites with a separate bedroom and a living room with TV, minibar and microwave. At Eagle beach, guests will enjoy Bucuti’s signature beach service and enjoy dining at one of three on-site dining facilities including the recently opened ‘Elements’ restaurant – Aruba’s first restaurant that serves a combination of world cuisine, organic and natural, gluten-free, and vegan/vegetarian dishes. 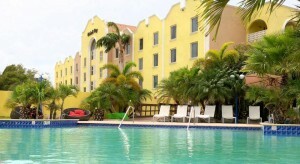 With 98 rooms, the Brickell Bay Beach Club & Spa is one of the bigger adult only hotels in Aruba. This hotel is located right at Palm Beach and only a 15-minute drive away from Queen Beatrix International Airport. It offers a large variety of rooms including superior triple rooms, two-bedroom suites, deluxe triple rooms, and deluxe rooms. All modern rooms feature a flat-screen TV, an iPod dock, and a work desk. You’ll find plenty of restaurants and bars in the surrounding high-rise hotel area, though the hotel has on-site restaurants available including a Chicago-style pizza restaurant. WiFi and parking are free for guests of the hotel. If you’re looking for a clean, comfortable adult only hotel that offers great value for money and direct access to Surfside Beach and Linear Park, make sure you check out the Aruba Surfside Marina. With just six rooms and suites, it is one of the top 5 hotels in Oranjestad and provides one of the best locations in the city. The Surfside Marina has a beautiful tropical garden that overlooks the sea, right next to one of Aruba’s best beaches that the island’s locals love to visit. 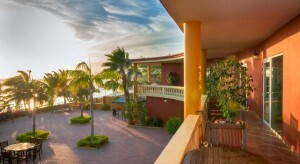 Surfside Marina has a bed & breakfast concept, which provides guests with an intimate stay that’s perfect for couples. Furthermore, the restaurant just in front of the hotel, named Pinchos, serves lovely food and is an excellent place for an evening drink. Just imagine yourself enjoying a good breakfast that’s served on your balcony each morning, while gazing at the Caribbean Sea, listening to the birds, and feeling the soft, warm breeze on your face without a care in the world. At night, you’ll be amazed by the sunset and the large cruise ships passing by in full light mode. The key to a successful vacation in Aruba is finding the perfect hotel, and by staying at the Surfside Marina, you will have your Caribbean dream vacation. If you’re planning on celebrating your anniversary with your spouse or partner, make sure you let the hotel’s staff know in advance, they’ll welcome you with a bottle of champagne on ice and flowers. What more could you wish for? Right next to the popular Palm Beach district and just a stone’s throw away from Eagle Beach, you’ll find the adult only Bubali Luxury Apartments. 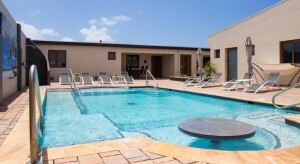 This eco-friendly apartment complex may just as well have been called the Bubali Adult Only Hotel Aruba, as you’ll get to enjoy free WiFi, free parking, a concierge service and a laundry service just like in a regular hotel. Bubali offers 4 very comfortable apartments, 2 of which have been recently renovated and the other 2 are brand new. All of the units are equipped with new furniture and modern facilities including a dining table, a coffee machine, dishwasher, and fridge. Outdoor facilities include a saltwater outdoor pool, a dining area, a sundeck, BBQ, and terrace. One of the apartments is wheelchair friendly for the physically impaired and features an adjusted bathroom, shower, and washbasin. The one-bedroom apartments are perfect for couples and feature a king-sized bed. Great nightlife, several shopping malls and some of the best restaurants in Aruba are just 1 km from the apartments. For those who’d like to stay in and cook themselves, groceries can be purchased at the Super Food Plaza just 200 meters away.